I know i haven't been updating the site lately but as you may know now, Hex has kind of left the remix business for a while.... So i simply don't have anything to update the site with. I just hope Hex will be back soon at his best and that he will make us happy again with his music. In the meantime, let's wish him a HAPPY BIRTHDAY as he will celebrate it with many friends and famous DJ's on 15th of April. 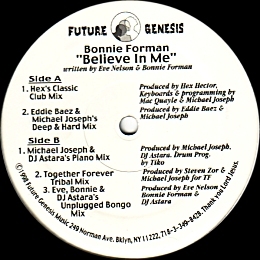 I finally found a copy of the BONNIE FORMAN record "BELIEVE IN ME". This one was remixed by Hex and Mac in 1999. The "Hex's Classic Club Mix" is 7:00 long with a great synth line. Not a big room anthem but still a very good mix. I posted a sample of this mix. Click the pick to reach it. 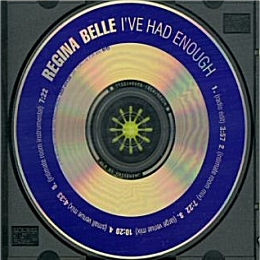 I also got a pretty rare promo CD of REGINA BELLE 's "I'VE HAD ENOUGH" featuring 2 unreleased before radio mixes. The "Intimate Radio Mix" and the "Small Venue Mix". This scarce promo CD was issued to radio stations only . Click the pic to get a full track listing. 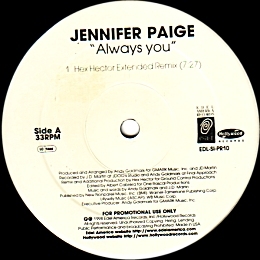 Last is a promo vinyl of JENNIFER PAIGE's "ALWAYS YOU". This 12" features the FULL 7:27 Hex Hector Remix along with a Dub and Instrumental. I think this mix was extended from the 3:58 Radio Mix because sadly it doesn't have a proper intro, nor breaks or buildups and some part of the mix really seem to go nowhere... But still a scarce record worth looking after for any Hex Hector fan. Click the Pic for tracks details.